Jeremy Piven is staying busy. He’s currently filming the Entourage movie which will reunite him with his former TV show castmates Kevin Connolly, Adrian Grenier, Kevin Dillon, Jerry Ferrara, Rex Lee, Debi Mazar, and Perrey Reeves. After that, he’ll reportedly be heading back to London to film the third season of Mr. Selfridge. According to RadioTimes, the show has been renewed by ITV. 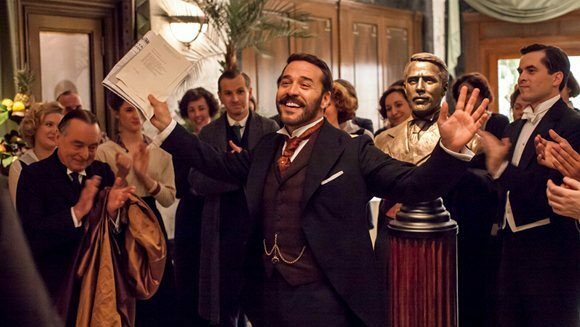 Mr. Selfridge revolves around the flamboyant American entrepreneur (Piven) who founded London’s famous Selfridge’s department store in the early part of the 20th century. The rest of the cast includes Frances O’Connor, Aisling Loftus, Katherine Kelly, Gregory Fitoussi, Amanda Abbington and Tom Goodman-Hill. The second season of eight episodes debuts on PBS on Sunday, March 30th, at 9pm. What do you think? Do you like Mr. Selfridge? How long do you think the series should run? you can get the book and read the whole story. I was disappointed too, but the book is even better because it has more characters! I do not miss one episode of this show & also can view it twice, which I do. It is so much better than Downton Abbey. Mr. Selfridge has more character interaction & there is always something exciting happening to all the characters. I’m also thrilled that Lady Loxley is returning & I love Lord Loxley. He portrays the perfect villain.